Weddings bring out the best in Adam Sandler. The sloppily mixed cocktail of ceremonial mayhem, ugly tuxedos, and awkward speeches has powered some of the comedian's finest -- or, perhaps more accurately, least irritating -- films. In addition to 1998's oddly sweet The Wedding Singer, which paired Sandler with his frequent co-star Drew Barrymore for the first time, there's 2012's cheerfully vulgar That's My Boy, which pushed the aging dad into a new realm of R-rated, gross-out buffoonery. 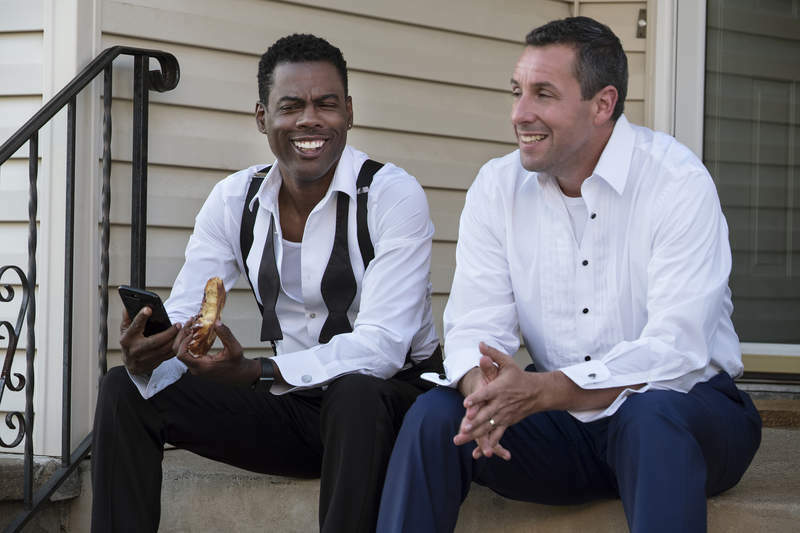 Now, we've got The Week Of, a family comedy that re-teams Sandler with his former SNL castmate Chris Rock for some My Big Fat Greek Wedding-style hijinks. It may not sound like much, but at least he's in his element. Though his Netflix exile has been great for Sandler's bank account, the past few years have not been kind to his creative output. With the exception of last year's Noah Baumbach ensemble film The Meyerowitz Stories, which was not produced by Sandler's Happy Madison production company, all of the comedies from Sandler's Netflix period have been groan-worthy, half-assed genre parodies from an artist not exactly known for his stylistic flexibility. 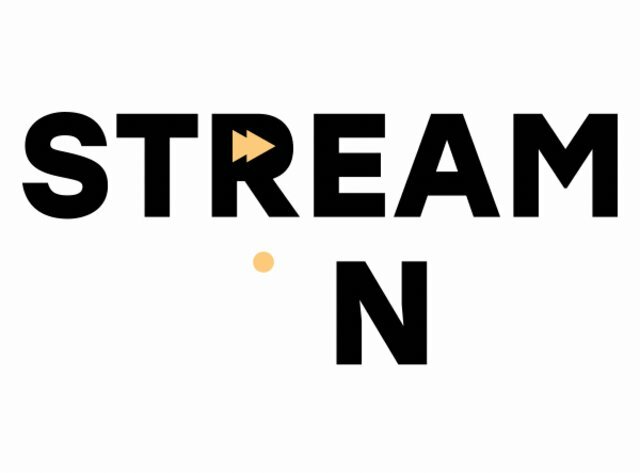 The Week Of is the fourth effort in what is now an eight-movie deal. Yes, eight movies. Let that sink in. From Ridiculous 6's occasionally-offensive-but-mostly-just-dumb Western gags, to The Do-Over's wan attempts at mimicking action-thriller cliches, to Sandy Wexler's mind-numbingly stale showbiz satire, none of these movies have played to the 51-year-old actor's strengths. With a few exceptions, like the underrated Don't Mess With the Zohan, he's not a high-concept guy. Instead, he might be the most low-concept movie star we have. Luckily, The Week Of is a movie that keenly understands the limits of the Sandler persona. Veteran comedy writer Robert Smigel, known for SNL's darkly clever TV Funhouse and his casually brilliant Triumph the Insult Comic Dog specials, directs a script he co-wrote with Sandler, and he brings a shaggy, low-key energy to familiar sitcom material. No one will mistake this for a high-gloss, auteur-driven Sandler project. (You'll have to wait for the Safdie Brothers' recently announced Uncut Gems for that.) But Smigel mostly strips away the wanton cruelty, priggish mean streak, and unnecessary celebrity cameos that plagues the worst Sandler movies. What's left instead? Goofy camaraderie between the two leads and a mood of slow-burn comedic anxiety about the claustrophobia of family life. 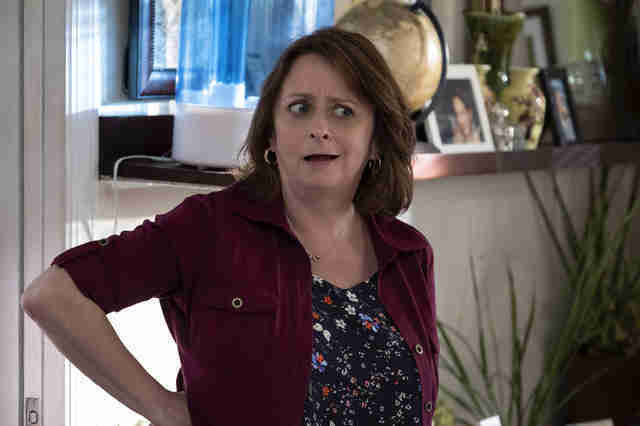 Plus, a deep roster of game supporting performers, including Sandler-regulars Steve Buscemi and Rachel Dratch, who can sell some of the movie's sillier concepts. The plot of The Week Of could not be simpler: Kenny Lustig (Sandler), a middle-class Long Island schlub, insists on paying for the wedding of his beloved daughter Sarah (Allison Strong), who is marrying the son of rich Los Angeles surgeon Kirby (Rock). Kenny is the put-upon, weak-willed family man who also gets in rage-filled (and very Sandler-ey) screaming matches with his insomniac wife (Dratch); Kirby is the divorced, status-obsessed high-achiever who can't make time for his own children. Kenny won't take Kirby's money. Kirby won't accept Kenny's friendship. As the title suggests, the movie follows the events of each day leading up to the wedding. There's no additional wrinkle to the formula. That's it. The closest thing the movie has to a "conflict" is that the tacky hotel where the event will take place keeps springing new leaks, so Kenny tricks the town's mayor into letting them throw a party honoring his amputee uncle at City Hall, where they will secretly hold the wedding. Eventually, this plan gets abandoned and Kenny's family ends up infesting City Hall with bats they catch under the overpass. Buscemi covers the chimney of the building with his body so the bats don't escape. This has very little to do with the story or themes, but feels worth noting. It made me laugh. After over two decades of Sandler movies, you've likely figured out whether or not you'll chuckle or roll your eyes at Sandler, Buscemi, and Dratch attempting to catch bats with nets. If you've never enjoyed a Sandler movie, don't start here. For the completists and loyalists, the most refreshing aspect of The Week Of might be that it's one of the first Sandler movies in ages where the protagonist doesn't simply live in a generic rich-guy fantasyland. Sandler will always come across a bit phony in these working stiff roles, but he's not throwing his money in your face here. Throwaway lines about basements lined with asbestos and sight-gags about giant bottles of booze you can buy at the duty-free store actually land because the Mets-obsessed, Billy Joel-loving, Long Island milieu of the movie feels relatively authentic and lived-in. It's not Cassavetes. It's also not Jack and Jill. Similarly, the rehearsal dinner sequence, which Rock hosts at a very famous global pop singer's mansion, finds comedy in small, specific details like Dratch marveling at flaky croissants in a glass jar. 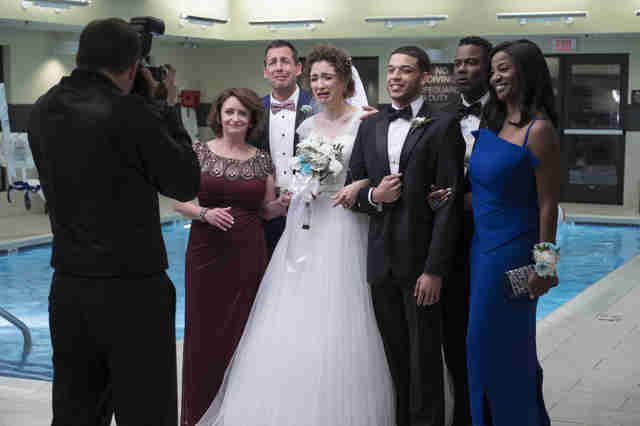 From there, the movie rides a wave of good will into the wedding, which climaxes with embarrassing dances, a 12-year-old DJ, billowing flames, and a tender reconciliation between Sandler and Rock that occurs while both are hoisted up in the air on chairs. Rock often struggles in comedies he didn't have a hand in writing, but he looks comfortable trading sentimental confessions with Sandler, who channels some of the same paternal sadness he so gently played in Meyerowitz. Together, supported by their fictional families, they finally look like real grown-ups.